This is my favorite time of the year. I love the beautiful colors of the trees, their constant metamorphosis into the rainbow of warm canopies. I love the cooler weather, the ability to roast marshmallows in the backyard without sweating off 20 pounds (however, if that were true, I think I could enjoy that). I love the smell of pumpkins and apples, cinnamon and cider. I love fall, but I love it more in the South. The great thing about the South during the fall is that you can get up in the morning, layer on a coat over short sleeves, and by the afternoon shed the coat and walk around in warm comforting sunlight. Fall in the South is wonderful. My boys want to be outside ALL. THE. TIME. They’re not crying about it being too hot or too cold. It’s quite literally perfect. The only problem is that Fall doesn’t seem to last long. 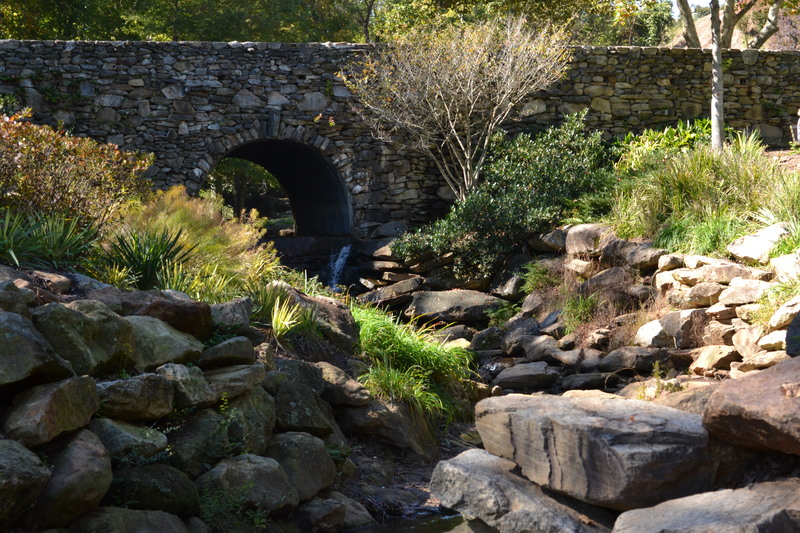 One of the bridges at Falls Park. So, knowing that the days will soon be getting shorter and our window of opportunity to enjoy the cooler weather closing, I’ve decided to start taking advantage of every free moment. Over the course of the past week, we’ve had bike rides, picnics, and planes. 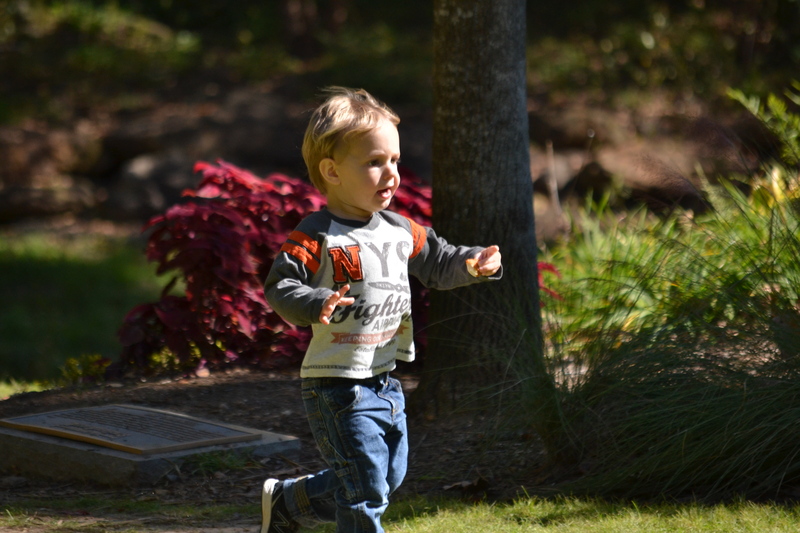 Since we live so close to the Swamp Rabbit Trail in Northern Greenville County, I try to get the boys out at least once a week. Davey hops on his bike and Henry and I tag along behind him. I love how the trail, which is old railroad tracks, looks at times to be carved into a mountain, the rocky terrain shadowing us on either side. 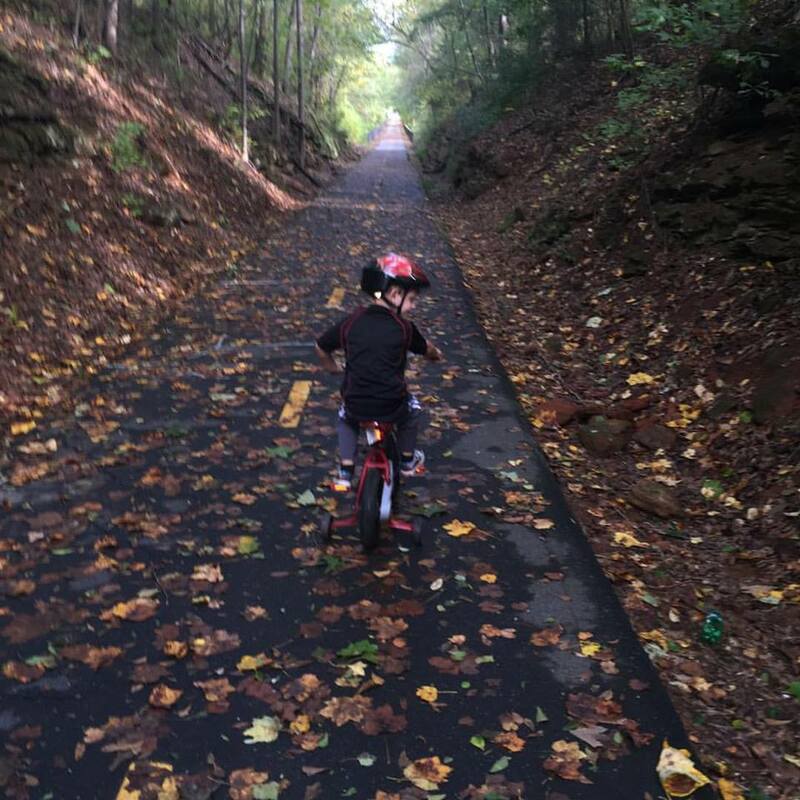 With the changing of the season, the trail is filled to the brim with leaves. It’s a great sight to see. Last week, after enjoying a run on the trail as it winds through Falls Park in Downtown Greenville, I decided that I would treat the boys to a picnic. My original intent was to hand make a lunch, but then reality sunk in and I remembered quickly that I’m not a Martha Stewart, but more of a Savannah Guthrie, so I shouldn’t push my luck and just be grateful I have the wherewithal to actually do a picnic. Instead of the hand made lunch, which I had romantically envisioned in my mind thanks to my binge viewing of Madmen episodes, I stopped at Chick-Fil-A. 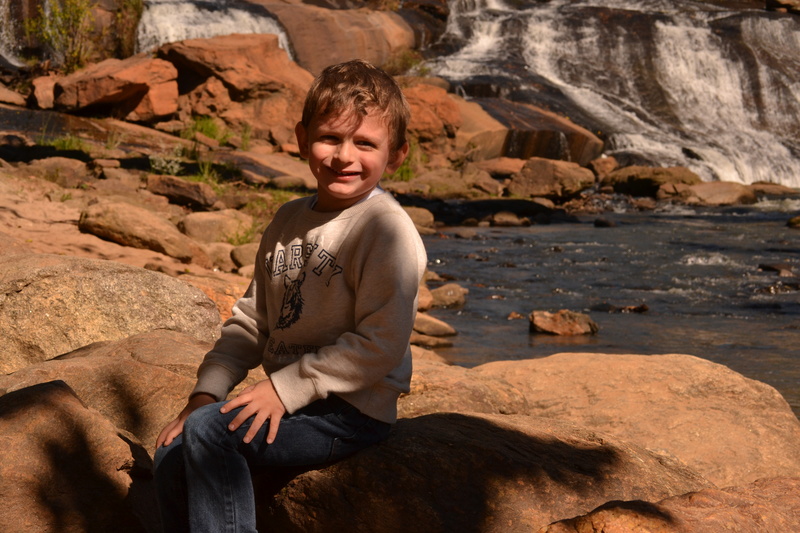 Hamming it up in front of the Falls. I packed a blanket, some snacks, some books, and loaded up the wagon. We parked near the Governor’s School, and strolled through the park, over rock bridges and onto some of the softest grass I’ve experienced this side of the Mason-Dixon line. The boys grabbed chicken nuggets and playfully ran about the park, picking up sticks and leaves along the way. We even had an opportunity to feed the ducks, an excitement beyond measurable proportions for Henry. That day was quickly followed up by a day out at our favorite café and park, The Runway Café and Park at the Downtown airport. 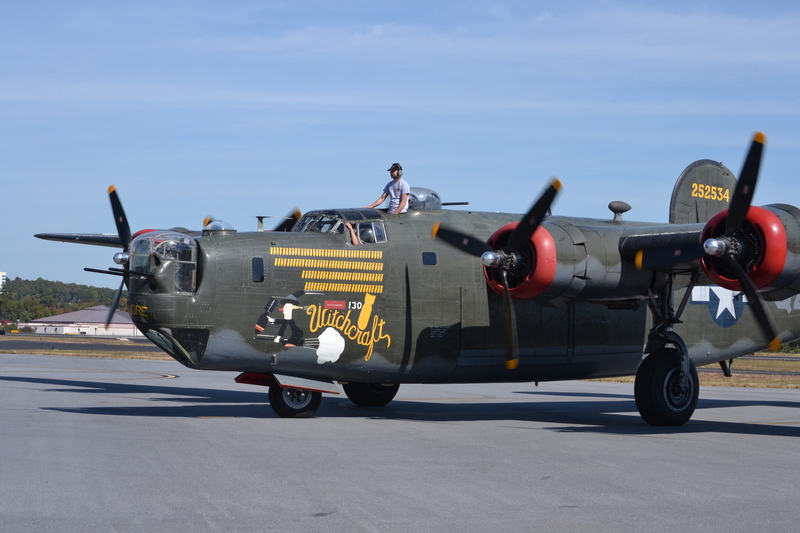 Three WWII era planes were scheduled to fly in around 1:30, so once again we took in the beautiful Fall day, sat outside on the patio, ate our lunch and watched some pretty awesome planes land. And while mommy was super interested in the planes, my boys really just wanted to run around on the playground, soaking in every last little ounce of Fall they could before it’s gone for another season. Unfortunately for us, rainy weather has moved in yet again, cutting into our fun outside. Stay tuned for all latest indoor adventures in Dreaming of Mommyhood.